TODAYSGOLD: LADY LYNDY SORCERESS OF LIGHT, BEWITCHING CONTEST WIN & ENCHANTING AWARDS! LADY LYNDY SORCERESS OF LIGHT, BEWITCHING CONTEST WIN & ENCHANTING AWARDS! Each of the Four Sacred Seasons: Spring Equinox, Summer Solstice, Autumnal Equinox & Winter Solstice, Dear Lady Lyndy will present for your viewing pleasure answers to your questions received through blogging comments &/or email. The Spring Equinox celebration once again has disappeared & yet the Holiday celebrations continue on with a Beautiful Spring Season. The glory of Easter Magick is just around the corner. Lady Lyndy's seasonal Spring Topic(s) are: NEW POSITIVE BEGINNINGS, MIND, BODY & SOUL HEALTHY IMPROVEMENTS TO MORE INFORMATION ON THE PUBLISHING OF MY BLACK CAT HALLOWEEN ART BOOK(S). How does one make a new beginning when the economy is collapsing? Stop stressing over the economy & start making your new beginning with the blessings you already have. Remember family & your belief system should be your center ALWAYS working with what you already have. What can one do to keep their mind, body & soul healthy during these stressful times? Staying healthy includes a balanced diet, getting enough rest/sleep, good hygiene & plenty of exercise. People who practice good nutrition, rest, hygiene & exercise patterns develop a lifetime of habits that will keep them healthy for many years. Especially during the stressful times. IMPORTANT: Keep your heart & mind strong by cutting out bad food additives. Read the labels on your grocery products. Since everybody has had to cut back this New Year, will you still be able to publish your black cat Halloween art book? Thank you for asking about my black cat Halloween art book. Yes, but the time frame has been delayed due to our credit lines being frozen for now. I'm determined to see this black cat Halloween art book through, no matter how long it takes! Have you asked anyone to help you with writing, photographing, computer organizing & publishing your black cat Halloween art book? Yes, I even provided a computer & a salary. But way to many wrenches were thrown in the path of completing this very special black cat art book even before this last economic crunch happened. The friends & people that were suppose to help did not or could not follow through. This was very disappointing, especially since I've spent so much time & money on many supplies & various art works. I've learned my lesson well, only count on yourself when it comes to completing any book project. First I would like to say, I always look forward to your informative Lady Lyndy Sorceress Of Light column. When you get the funds & if you are self-publishing, have you decided what publishing company is probably best for your black cat Halloween art book? THANK YOU for your very nice comment. Yes, I don't want some fly by night self publishing company, so I have decided on the Amazon Publishing Company. That way my black cat Halloween art book will be in the Amazon Book Stores (Including the Internet Book Stores) & in the public libraries, especially school libraries, etc.... This will cost quite a bit more, but well worth it because of the distribution considerations. PLEASE REMEMBER, that I'm dealing with 50 + artists & not just my own personal black cat art work. I never in my wildest dreams thought I could write & publish an art book of this magnitude over night. 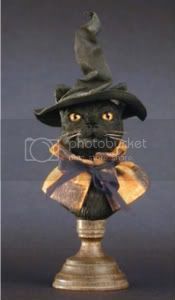 It took time & loads of money (all on my credit cards) just to acquire this black cat OOAK Halloween art collection. So keep good thoughts & good prayers for my book project to keep moving forward. It was always about my love for all my favorite black cat Halloween art & artists in the first place. Spooky Good Luck Again because I won! THANK YOU for this WICKED Giveaway & Carolee Clark for her Fabulous Painting. THE SISTERHOOD AWARD Here's a wonderful opportunity to really feel like were all a part of the Divine Secrets Of The Ya-Ya Sisterhood! Whenever you see this award on other blogs far & near, you'll know the secret of THE SISTERHOOD... OH sorry, it's ATTITUDE & GRATITUDE! THE PROXIMIDADE AWARD Here is the description of THE PROXIMIDADE AWARD..
1. 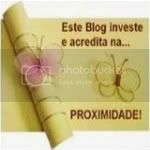 RETRIEVE the SISTERHOOD, PROXIMIDADE & KREATIV AWARDS for your blog. 2. NOMINATE TEN BLOGS (more or less) SHOWING great SISTERHOOD, ATTITUDE, CREATIVITY & GRATITUDE! 4. Add the AWARD PICS & AWARD DESCRIPTIONS. 5. 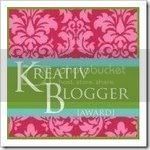 List your TEN FAVORITE THINGS FOR THE KREATIV AWARD. 6. LEAVE a COMMENT ON NOMINEES BLOG that THEY have RECEIVED these AWARDS. 7. SHARE the SISTERLY LOVE & LINK to the PERSON THAT HAS GIVEN YOU the AWARDS. If you have already received DUPLICATE AWARDS, please PASS FORWARD the NON-DUPLICATE AWARD(S) with appropriate instructions. "Help one another, is part of the religion of sisterhood." "Link one another, is part of the dedication of sisterhood." Looking forward to the Summer Solstice & your questions received through blogging comments &/or email. LADY LYNDY SORCERESS OF LIGHT is an advice column on COLLECTING ORIGINAL ONE OF A KIND FANTASY BLACK CAT ART WORK, HELPFUL TIPS ON KINDRED TOPICS & PROMOTING POSITIVE REINFORCEMENTS. Wonderful blog post! I love all of your heartfelt advice on positivity in difficult times. We can all use those reminders. And i can't wait to see your book on black cat art!!! How fun! Have a super fantastic day :). Hi Lyndy ~ Lucky you to win Melissa's blog giveaway - big congrats on another wonderful piece for your black cat collection!! Hope you are well too. Thank you so much dear Lyndy, I am very honoured. Hi Carrie, thank you for the lovely comments. I'll have to save up some funds for a pretty Snippet Girl OOAK Black Cat. You create awesome whimsical art work! Friday the 13th continues to be my lucky day, especially receiving Melissa's FANTASTICAL Holiday Black Cat Stick! CSN&Y have always been one of my favorite R & R groups. They have that magickal feeling to all their music. Hi Hermine, you deserve many awards for all your wonderful art work & charming posts. Have an enchanting week filled with love & joy. I'll add it to my next blog post! Hi Jen, thank you for the sweet comments. Enjoy the awards! Congrats on your recent blog awards & winning Melissa's blog giveaway too. Thanks for the award & PR shout-out to me as well. I truly appreciate it & will reciprocate in kind soon. PS: Thanks too for the vote of confidence on my web revamp and for taking the time to check it out! Hi Chris, thank you for the super comments. I knew you would say WHAT?! Even my hubby said WHAT?! After all it's 'Spring Time In Paris' too, LOL! Hauntingly Yours Forever & A Day! Finally got your blog award up & thanks again! Popping in to say hello & wish you & yours a wonderful Easter weekend! Hi Kaylee, thank you for your nice comments. Hi Lori, thank you for you for getting back to me. You deserve the fun awards! 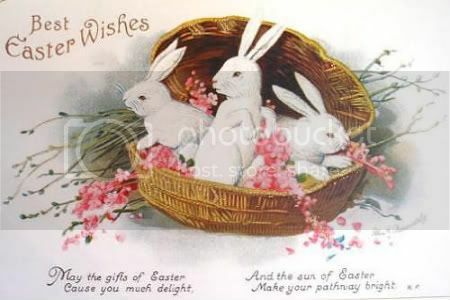 Hi Chris, hope you & yours have a Fabulous Easter & Passover too! Hi Lyndy, great advice column! Question though? I see you love Halloween. 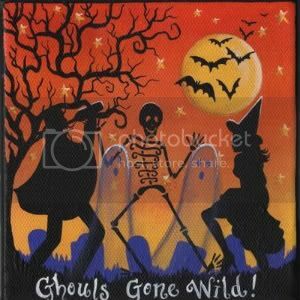 That Ghouls Gone Wild painting & contest is great Halloween fun. But isn't it seasonal? It's only spring! Hi Angela, thanks for the comment & great question! I love Halloween all year long. In the Millennium the Halloween 'OOAK' Original One Of A Kind artist has become more than just a seasonal artist. WHY??? Because some (sorry not all) of these craft artists have become part of an incredible art movement. They have superseded the craft world with their wonderful art work. They have become 'Today's Gold' in collectibility with actual investment quality art work. That's why I'm writing my Halloween black cat art book, so I can explain the history of Halloween art collectibles through the OOAK art works of these very talented Halloween artists of today. * My opinion is that the best thing would be to work on till art lovers feel drawn toward it of their own accord, instead of having to praise or to explain it. Sadly, Vincent Van Gogh never knew how much he & his art would be loved or it's worth, (in the millions). My opinion is that one should not leave this planet young or old without ever knowing their worth, be it art, life's accomplishments or how much they are loved. AND on Halloween or at least once in a lifetime one should be allowed to have as much sweetness & joy as one can possibly want & hold. 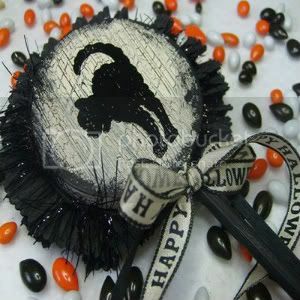 I prefer OOAK Halloween Black Cat Art all year long, it's less fattening! I'm a classical pianist, musical therapist/teacher, artist, antique/collectibles dealer, author/publisher AND a Look-A-Like for Felicia Hardy AKA The Black Cat! I love to garden, paint, create jewelry from antique gems, collect vintage and OOAK ~ One Of A Kind black cat Halloween art, eBay surfing and spending time with my fur babies. Do not go where the path may lead. Go instead where there is no path & leave a trail. Awesome Lightning Electrical Storm Sydney Harbour Bridge, Sydney - Australia. The golden sun setting on the earth's horizon over the rippling Pacific Coast waters of Malibu Beach, California ~ USA. Flash Thunder & Lightning Storm over Southern California ~ USA. Swirling eerie glow of the Northern Lights ~ Aurora Borealis dance magically over the Interior of Mount McKinley Alaska, Denali National Park ~ USA. The meaning of life is contained in every single expression of life. It is present in the infinity of forms & phenomena that exist in all of creation. LIFE'S A ROLLER COASTER ~ JUST HANG ON TIGHT!!! Thanks For Flying By * Come Back Soon * © 2007~2019 Todaysgold Publications ~ All Rights Reserved. Simple theme. Powered by Blogger.